The ultimate in comfort food must be any meat dish, or meat and creamy mashed potatoes smothered in a rich, onion gravy. The bringing together of sweet onions and a dark rich sauce—which is both sweet and savory at the same—is a classic of both the British and Irish kitchens. 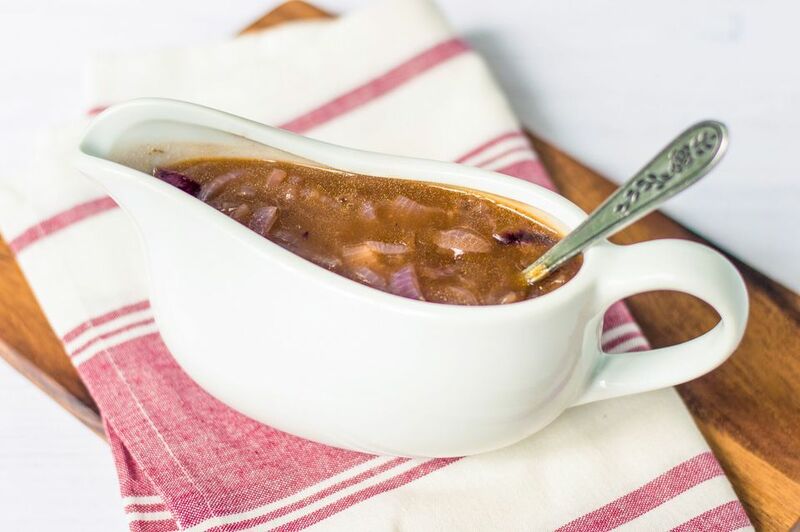 This recipe for onion gravy is so quick and simple to make and is perfect with bangers (sausages) and mash, most roast meats, slathered on a toad in the hole or as a filling for Yorkshire puddings. Melt the oil and butter in a large saucepan over a gentle heat to ensure the butter does not burn. Add the thinly sliced onions to the pan and cover with a lid. Cook slowly for approximately 10 minutes or until the onions are soft and translucent, again, taking care not to burn them. The onions should not be browned but instead just melted and soft. Add the sugar and balsamic vinegar to the onions and stir well well to ensure the onions are coated. Cover again with the lid and continue to cook for a further 5 minutes, again making sure they don't burn. Add the beef stock to the pan and stir well. Boil gently, uncovered, for 5 minutes. In a heatproof jar (you can even use a mug) or bowl mix the cornstarch with the cold water to create a thin, lump-free paste. Pour a little of the hot gravy into the starch mixture and shake or mix thoroughly. Pour the starch mixture back into the gravy. Raise the heat to high and boil hard for 10 minutes or until the gravy is slightly thickened. The best onions to use are red onions because they provide just the right amount of sweetness without making the gravy too cloyingly sweet. If you prefer a slightly sharper flavor, then use a standard yellow or even a white onion. You can also use large shallots, if you like, which will create a much softer finished gravy. To create an optional shine on the gravy take 1 teaspoon of ice cold butter and whisk it into the finished gravy before serving. The butter will add even more flavor and make the sauce glossy. This is such a snap to make, why not make double, even triple the quantity? Use what you need, then freeze the rest in 1-cup portions. The gravy freezes so well and will keep for up to three months. Simply defrost in a pan or the microwave.